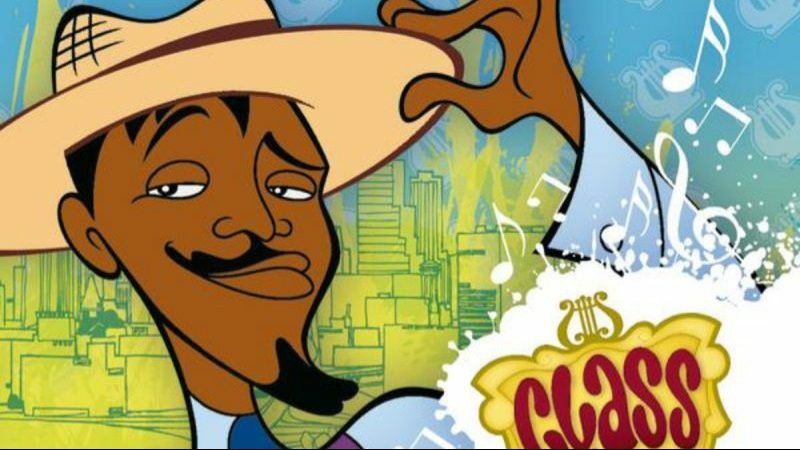 This week’s minorities in cartoons entry is “Class of 3000,” an animated series that debuted on Cartoon Network in 2006. Andre 3000, a member of the hip hop group Outkast, created the series. Lil D: An African-American kid, and Sunny’s biggest fan; Lil D’s the show’s main other character. Madison: A ditzy blonde girl with a Southern accent. Philly Phil: A geeky boy genius/inventor. Tamika: A sassy African-American girl. Eddie: A wealthy but nice boy; he has an unrequited crush on Tamika. Kam: A rational-minded Asian-American boy. Kim: Kam’s twin sister; seems more energetic/materialistic than her brother (from what I saw of the show). “Class of 3000” has plenty of zany aspects that wouldn’t be out of place on “The Simpsons” or a slapstick cartoon (such as a bear driving a sports car). The show’s two-episode pilot took a satirical view of some things, such as a wealthy minister. The series is one of the few animated cartoons set in Atlanta. It’s also one of the rare cartoons that doesn’t portray the city or region as either devoid of African-Americans or mainly hillbilly/pre-Civil Rights Movement-era stereotypes. (Or both.) Aspects of Atlanta appear in the series, including the neighborhood of Little Five Points. Of note, Atlanta’s also the center of a large number of rap/R&B musicians; it’s also the hometown of Andre 3000 himself. Andre 3000 himself voices Sunny. Actress Small Fire voices Lil D.
The series ran for two seasons of 28 episodes. The show featured a song in each episode; a soundtrack of the show’s first season was released. Unfortunately, it’s hard to find on home video. iTunes (but not other digital video stores) has most of the show’s run available. A Region 4 first season DVD box set is the only DVD release available. Region 4 is the DVD region for Australia, New Zealand, and Latin America. Here’s “Class of 3000″‘s opening credits.